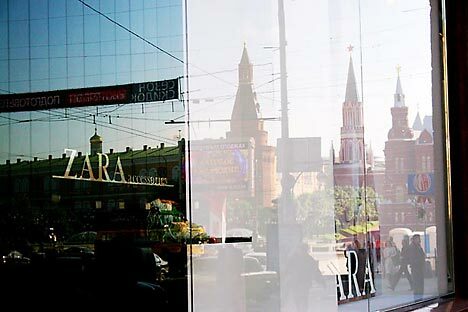 In 2013, the company will open a Zara shop in Vladivostok. Source: RIA Novosti. The Spanish company Inditex plans to continue its aggressive expansion into the Russian market, it has been opening 50-60 new shops annually over the last few years, and would like to maintain this pace. Inditex-owned brands have been sold by various distributors in Russia since 2003: Zara has been promoted by Finnish Stockmann, the Pull & Bear brand by Moscow’s Arts Group, and the Stradivarius brand by Intersport Rossiya. In 2006, Inditex announced that it would market its products independently and bought the stores that sold its brands from the distributors. By 2007, Inditex was operating 30 shops in Russia and more than 3,200 shops globally, making it the third-largest clothing retailer in the world, behind Gap Inc. and H&M Hennes and Mauritz AB. By September 2012, Inditex had expanded its network in Russia to 274 stores, including 58 Zara shops, 50 Bershka outlets, 47 Pull & Bear and 47 Stradivarius stores, 18 Massimo Dutti shops, 37 Oysho outlets, 12 Zara Home shops and five Uterqüe stores. In 2011, the retailer opened 49 shops in Russia and, in the first six months of 2012, another 18 new stores were added to the chain. “Russia is an important market for us. We would like to have stores everywhere that customers want them,” Echevarria said. In 2013, the company will open a Zara shop in Vladivostok, which Echevarria says is a milestone for the company. The fast-paced business of fashion retail, in which collections are often updated to keep up with fashion trends, is built on efficient logistics. Store managers order products twice a week, and, according to Echevarria, Inditex has all orders for all its stores in Russia executed within two days. Federal retail networks outside of the food industry have few points of sale in the Russian Far East because of the logistical challenge, according to Yelena Yushkova, analyst at IFK Solid. The region has been short on shopping areas in the last few years, but no new retail facilities are being developed, says Yushkova. Andrei Vasyutkin, head of the research and consulting department at Magazin Magazinov, agrees: there are no shopping malls in Vladivostok, despite the high consumer potential of the local population. Brands that traditionally compete with Inditex are already operating in the region. These include Benetton, Gant, Levi’s, Mango, Motivi, Sisley, Terranova and others, which mostly operate via franchising partners. The InCity chain used to have a franchising outlet in Vladivostok but, in December, the retailer will open its own store in the renovated GUM mall in the city center, says the spokesperson for InCity, Irina Alpatova. Inditex, which operates 5,693 stores, reported revenues of $9.3 billion in the first half of 2012. It is currently the largest garment retailer in the world, with stores in 85 countries. Even so, Inditex is not among the biggest retailers in Russia. According to Infoline, the Spanish group’s revenues went up 20 percent in 2011 to 13.6 billion rubles (about $433 billion). In terms of revenue, the Spanish company is the 47th largest retailer in Russia, far behind such local players as Sportmaster (47 billion rubles in revenues), CentrObuv (29.3 billion rubles) and Gloria Jean’s (15.5 billion rubles). The full version of this article was published in Russian in Vedomosti.ru.